Clam garden event in Sidney. Source: Parks Canada, click for full poster. This looks like it will be a really cool and interesting event out in Sidney and if you, like blog world headquarters, are on the south island you might want to check it out in person. Snacks included! The great news though is you can register for an online webinar if you can’t make it in person. Kudos to Parks (and their new Clam Garden facilitator and friend of this blog, Sarah R.) for setting that up. The full details are in this poster, but the short version is: the time is 6.30 and the location is the Shaw Centre on the Sidney waterfront. If you want a quick primer/links on clam gardens, then keep reading. 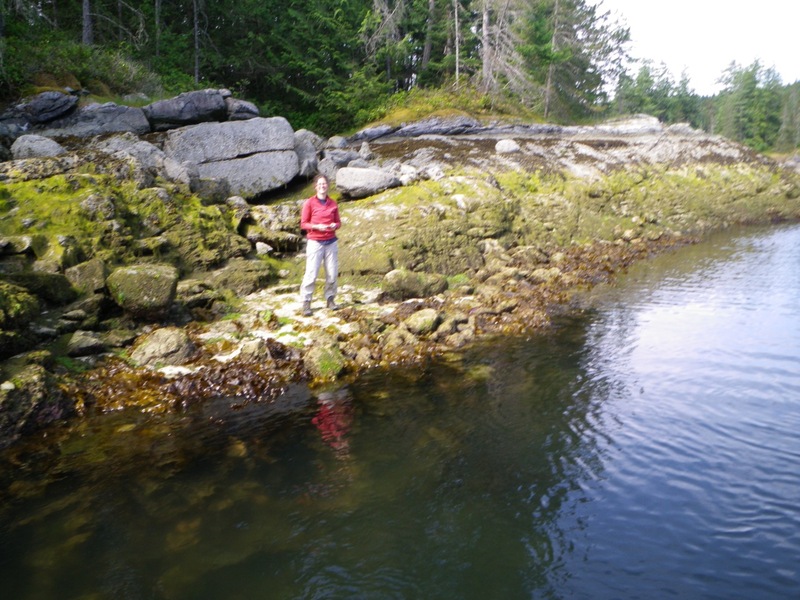 UVIC field school student helping map in a clam garden on Russell Island, Salish Sea. I’ve never really done “clam gardens” justice on this blog, but in the course of introducing some speakers I did go over them a little. Since then I’ve had the chance to work with Dana Lepofsky and her team on Quadra Island and wow, I was blown away by those features. Clam gardens are quite variable, but the most typical is a rock wall built at zero tide which acts to trap sediment lessen the steepness of the natural intertidal zone. Many of those Quadra ones are actually built on bedrock, turning very low productivity bedrock shelves into productive clam beds. It seemed like practically the entire shoreline of Waiatt Bay had been terraformed by people. 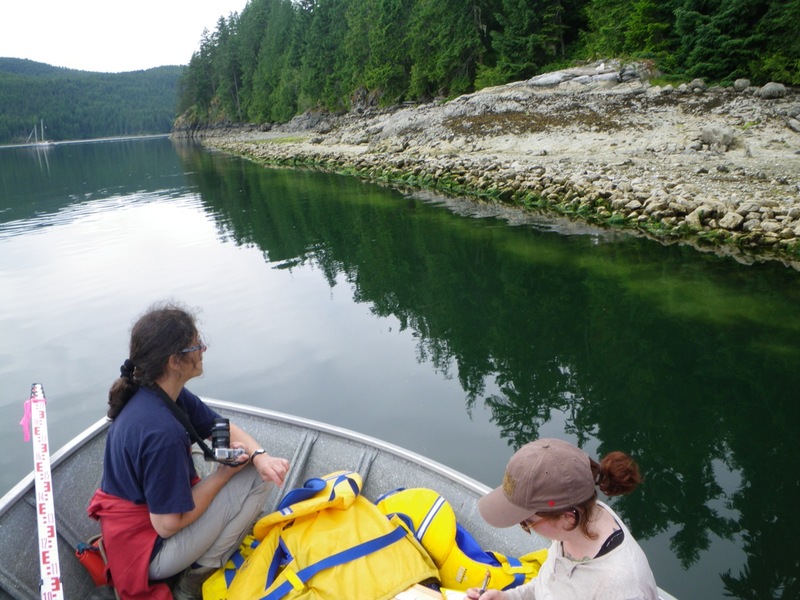 It’s fairly revolutionary to our understanding of Northwest Coast subsistence, in which shellfish have always (ironically, in some ways, considering the size of the middens) been undervalued and under-studied by archaeologists. Part of that salmonopeia, I guess, though there’s probably systemic gender bias involved as well — every NW Coast Archaeologist should read “Shellfish and Gender” by the essential Madonna Moss. 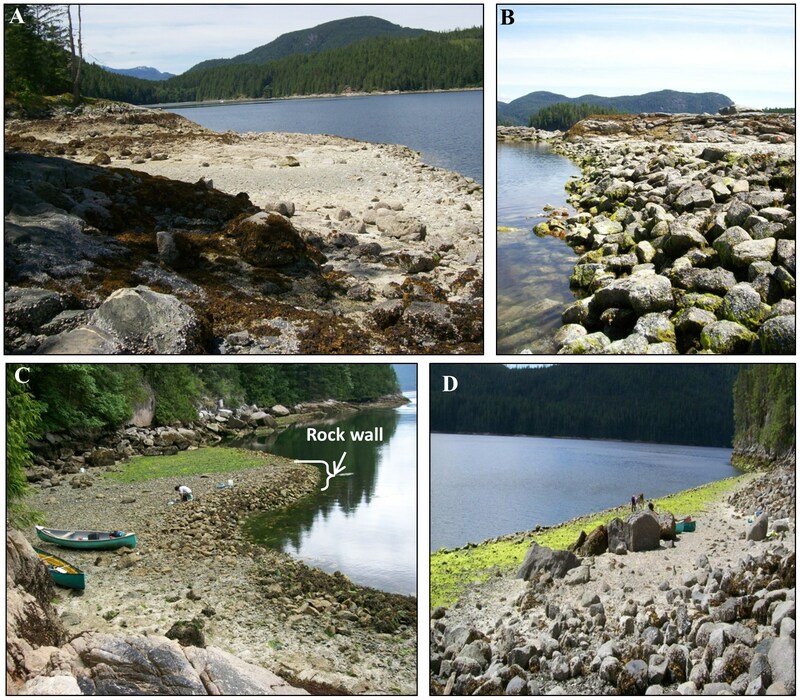 There’s some clam garden videos and more information linked here via SFU, and the open-access research paper by Groesbeck et al. from earlier this year if you want to buff up your clam garden knowledge. And, of course, there’s an excellent popular book on the topic, though so much has been learned in the few years since its publication, and the ubiquitous Jude Isabella also has a great piece on them from a couple of years ago. There’s other videos out there, here’s the trailer for one of the best. If you are interested and inclined, you can also follow the Clam Garden Network on twitter. The upcoming event in Sidney should be great. I’m not describing it as a “talk” since it seems to be more of an “event”. 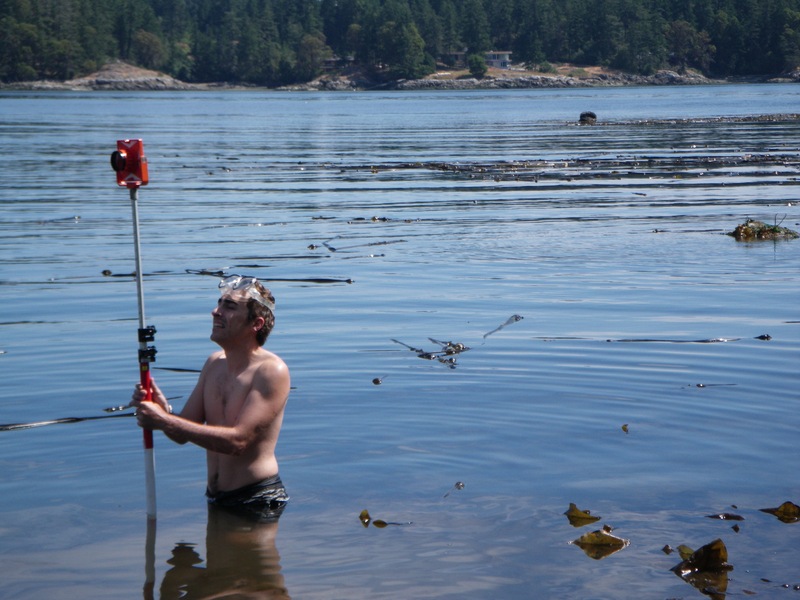 John Harper, one of the first, if not the first, from the science community to recognize clam gardens will be there. The inimitable Nicole Smith, who’s at the hub of current archaeological understanding of clam gardens will also be there. And, Nathan Cardinal who, among his many responsibilities in Gulf Islands National Parks Reserve, takes a particular interest in clam gardens including a project to restore/rebuild one and in that way be able to really monitor how they work. The actual restoration study, which also involved Audrey Dallimore from RRU and others, is more fully described here. It sounds like there may be speakers from local First Nations representatives and/or knowledge holders as well. Not to mention, snacks. The amount of stone involved in gardens like the one directly above is mindboggling, and is another aspect of the use of stone we often underestimate on the NW Coast. The clam gardens are so interesting archaeologically in their own right, but much like the herring case from this blog a few days ago, the integration of traditional knowledge, historical ecology, restoration and conservation biology, and archaeology is really fruitful for all concerned and has real-world outcomes for environmental health and food security isues. This community evening will be an opportunity to learn about a collaborative project between WSANEC and Hul`qumi`num First Nations and Parks Canada. The guest speakers include WSANEC and Hul`qumi`num elders/knowledge keepers, Dr. John Harper- marine geologist, Nicole Smith- Clam Garden Network, and Nathan Cardinal- Parks Canada. A highlight of the evening will be the release of two short videos about recent trips to the clam garden sites with local First Nations youth. The videos were filmed during activity visits sponsored by Parks Canada, the Natural Science and Engineering Research Council of Canada’s PromoScience Program, and Royal Roads University. This project is an opportunity for Coastal First nations and Parks Canada to learn about eco-cultural landscapes together and how they can be restored. 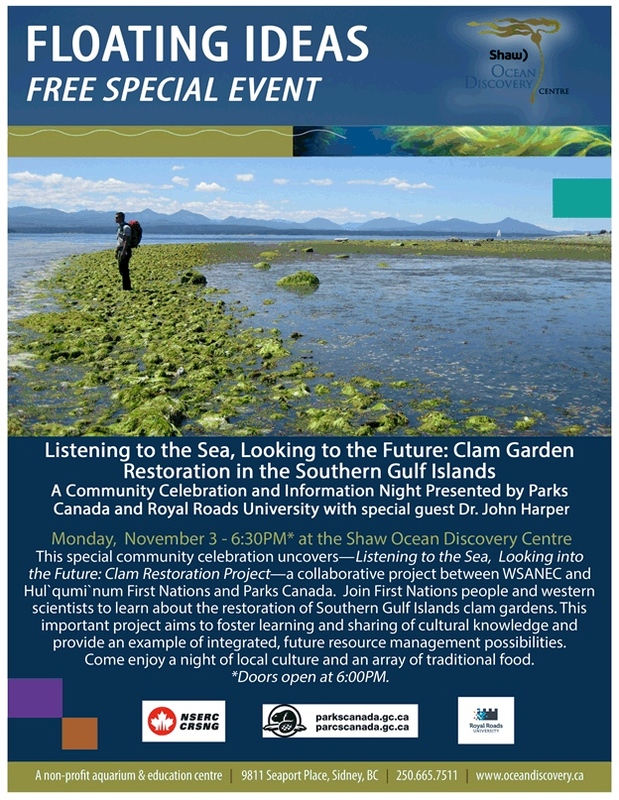 Come enjoy a night of local culture; share an array of traditional food, acquire knowledge, and celebrate the exciting Listening to the Sea, Looking to the Future: Clam Restoration Project! Quadra Clam Gardens. Source: Groesbeck et al. PLOS-1, 2014. This entry was posted in anthropology, Archaeology, First Nations, Northwest Coast, Shell Middens, Technology, Vancouver Island and tagged clam gardens, clams, Parks Canada, Salish Sea, shellfish, Sidney BC. Bookmark the permalink. Yesterday we picnicked on a beach at Cape Campbell on the E side of the south Island of New Zealand composed largely of clam and abalone shells. Would be interested to know if the Maori had clam/abalone habitat enhancement techniques and if in fact these beaches are middens at all but they sure look like them. I lived in Bethel, Alaska along the Kuskokwim River for eleven years and quickly discovered that salmon (kings, chums, reds and silver) have a very short shelf life either dried or frozen. Our dry fish was carefully dried on a shaded fish rack built where it got a steady breeze in the summer. Flies were rarely a problem and the fish were given a light smoke in a smoke house (very smoky and a variety on non-conifer wood was used) to finish the final desiccation of the fish, Fish were usually stored in open work grass baskets. Mold would appear on the fish before Christmas but it raised no health issues. It left a slightly bitter after taste that was mollified by a bit of jelly or jam on a piece of pilot bread., However by the beginning of March the damage caused by the mold had destroyed most of the food value of the fish. Dried herring and whitefish is good for a full year or more while dried pike is quite eatable for over two years. Salmon are so delicate that silver salmon taken in the rainy fall were formerly buried whole and dug up and eaten later. Today they are frozen whole, home canned or salted and put down in wooden barrels and eaten cooked after several rinses or eaten pickled. Heads are still buried and fermented. White fish, pike, burbot, and shee fish are caught most the year. In the winter we shove 2″ gill nets under the ice. We catch mainly round and hump back white fish and a few ciscos, They are also hooked thru the ice and caught in gill nets in the spring and summer. Each of these fish and others (blackfish, needle fish and long toothed smelt) have their season of extra-ordinary abundance and during these periods the other fish are incidental catches. This is the calendar for The Central Yupik on the Kuskokwim River On the Yukon, you can add a fall run of chum salmon and a Halloween run of lampreys. Val — I don’t know. The Maori had agriculture of course, one of the big things on the coast here are that NW Coast people had been placed by archaeologists in the category of “complex hunter-gatherers” and it was wondered how could they have had such population densities, social stratification, monumental architecture, etc. on a basis of food collection. We now know that “hunter-gatherer” is something of a spurious category wherever it is found .. not only are agricultual societies full of wild foods (go into any grocery store and count the wild goods you can buy, it’s amazing) but hunter-gatherers practiced all kinds of environmental manipulation and resource management. So one value of the clam gardens is they really hit NW Coast archaeologists over the head with a big “your dichotomy is false” hammer. Richard — thanks for the comment. Did you maybe mean it to be in the herring thread? I can move it if you leave a note. I’ve passed on a couple of papers to Dana from the Russian Far East describing oyster cultivation there (Mariculture). Only a few pieces in English, but to my knowledge, that is the only other case for shellfish cultivation. Thanks Jesse. Do you have references for those Russian ones we can post here? All of the key refs are in this article. 2008	On Oysters and Archaeologists (the Notion of ‘Aquaculture’ in Far Eastern Archaeology)*. Archaeology, Ethnology and Anthropology of Eurasia 4(32):52-61. Thanks for that reference, Jesse. Good to see something from Andrei Tabarev on that, known for his lithics work, especially on microblades, great flintknapper too. A. Rakov and D.L. Brodianski. The present authors set forward new arguments favoring the existence of aquaculture as a branch of producing economy in the Northern Pacifi c region. Having examined the shell middens of several coastal Neolithic and Early Iron Age sites as well as ancient and modern oyster farms, the authors conclude that the existence of incipient oyster cultivation on the coast of Peter the Great Bay can be considered a firmly established fact. Mad Dog — Tabarev visited us here in Victoria a few years back — interesting guy, amazing scope of research. It was an interesting evening – thanks for bringing it to our attention, it was worth going. Part of the answer to Val’s question about New Zealand may lie in the tidal patterns in the area. It seems likely that in areas with very little tidal variation, there may be much less opportunity for this kind of modification.